This Fig Vanilla Almond Chia Pudding with pomegranate seeds and pistachio nuts is infused with the aromatic and fragrant flavours of the Middle East. Green cardamom is great in desserts. It has a spicy, herbal, citrusy character and works really with vanilla, pomegranate and pistachio. The pomegranate molasses adds complexity and depth. It has a unique sweet, tart flavour taste that adds just the right amount of acidity to the chia pudding. Figs and pomegranate are two of my favourite fruits. They work really well together but are also great with pistachios and almonds. In Europe, autumn is the season for these sweet, purple figs with dark red flesh. There something truly decadent about sweet, ripe figs. 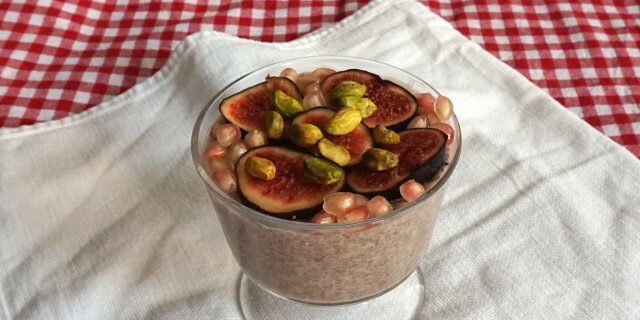 This decadent Fig Vanilla Almond Chia Pudding is a great way to indulge yourself with something sweet and delicious while staying healthy at the same time. Pour the mixture in small glass bowls or glasses, cover and refrigerate overnight or for about eight hours. Chia seeds will be plump and absorb most of the liquid. Just before serving, add pomegranate seeds, pistachio nuts and sliced figs.